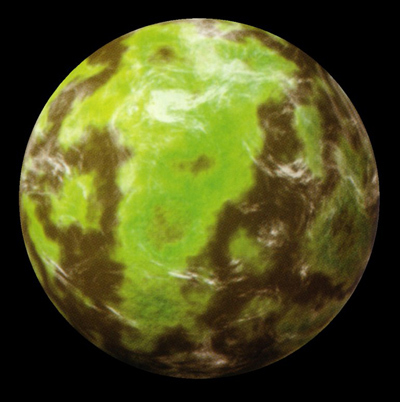 Gamorr was the agrarian homeworld of the pig-faced Gamorreans, located in the Opoku system of the Outer Rim. It was third planet orbiting the sun and had one moon. Its varied terrain ranged from frozen tundra to deep forests, and was considered quite pleasant by off-worlders. Nevertheless, tourism was highly discouraged to Gamorr because of the vicious lifestyle of ferocious, bloody warfare constantly being waged between rival Gamorrean clans. Prominent mushrooms were also found on Gamorr, as were native coolsap trees. Gamorr was first visited thousands of years prior by the space-faring Rakatan Civilization who would hold it for almost five thousand years. Eventually, the Gamorreans spread out from the galaxy, earning a reputation as being among the most violent and ferocious mercenaries in the galaxy, and many factions used that to their advantage. During the Great Sith War the combined armies of Krath and Sith bolstered their ranks by using thousands of Gamorrean mercenaries to serve as cannon fodder against the Republic forces. During the war Gamorr was considered to be under Sith occupation. When the Galactic Republic drove the Sith forces away, the world returned to a state of primitive isolation. Both Mandalorians during the Mandalorian Wars and Sith Empire during the Jedi Civil War avoided the planet, but during the Dark Wars several Sith warlords pressed Gamorrean mercenaries into their service, and the planet changed hands among nearly a dozen Sith warlords during that time. Around 1,002 before the Battle of Yavin, the Brotherhood of Darkness operated a Sith academy on the world that specialized in the training of Sith Warriors and Marauders. Under the Galactic Empire, it was the site of a NAMIS disaster. Though ignored by the Galactic Republic during the Clone Wars, Gamorr was given special attention by the CIS. Thousands of Gamorreans, less concerned with galactic politics and more interested in a good fight, were taken offworld by the Separatists and employed as mercenaries. The Gamorreans rarely served the Separatists with distinction, and they were instead employed for dangerous frontal assaults. As a result, the survival rate for Gamorrean mercenaries working for the Confederacy was less than 8 percent. The Hutts, upset with the Confederacy's claim on so many Gamorreans, petition the Separatists in an attempt to preserve their own hold on the planet's natives. The Trade Federation negotiated a finder's fee, paying a bounty to the Hutts for each Gamorrean that the Confederacy hired in the course of conflict. Although this resulted in only a minimal profit for the Hutts, it eased their concerns over the perceived Separatist encroachment on a labor force that was largely considered theirs. Though the war never came to Gamorr's surface, a number of small space battles were occur in neighboring star systems. Separatists established a single base on Gamorr's moon, but by the end of the war, it was completely abandoned and overtaken by pirates. Gamorr was also a site for podracing, the events were made safe by the Hutts. One podracing event was located in the ruins of the ancient Gamorrean Carnuss Gorguul's citadel. Though the Gamorreans did not develop space travel, they established a colony on nearby Pzob. However, the planet was never united under a single government, and remained unaligned after the fall of the Empire.